New Collage Prints & Email Blog Posts! I’m excited to start offering 16×20 collage prints. 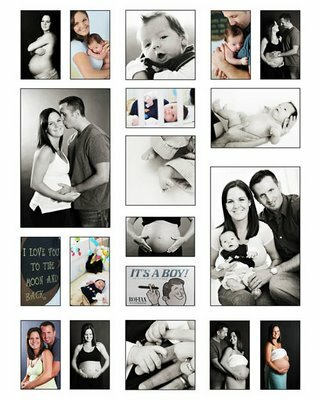 They are great for maternity and baby sessions and come mounted, ready to hang on your wall! It’s a fun way to display a lot of images and tell a story at the same time. These will be an ala carte option to my portrait packages and are priced at $215. I’ll design the layout for you and have you proof it before it goes to the lab. Also a reminder to get your loose print orders in as soon as possible for the holidays. It takes about 1-2 weeks for the order to be completed so please plan accordingly. You can now receive my new blog posts via email! How cool is that? Now you’ll know what’s happening at Jasmine Photography right away….sweet!